Line 9”x13” baking dish with foil (smooth out foil as best you can), and spray with butter-flavored oil. Finely crush saltines that have been placed in large ziploc bag with a rolling pin. Arrange crackers in single layer onto baking sheet. In a small saucepan, combine the sugar and the butter. Bring to a boil over medium heat, and then time boil for 3 minutes more “without stirring.” Immediately drizzle over crackers as evenly as possible. Bake for 7 minutes. Remove cracker toffee from oven and sprinkle top with chocolate chips. 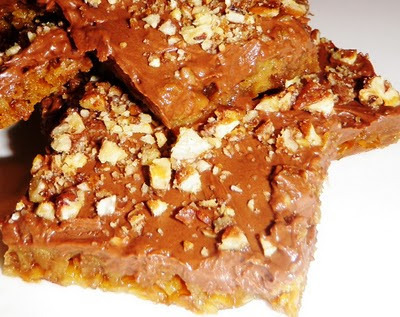 Let stand for 5 minutes, and then spread melted chocolate evenly over top of cracker toffee with spatula, and top with chopped candied pecans. Cool for 15 minutes and cut into squares while warm, and then completely cool (approximately 2 hours) at room temperature. Enjoy!